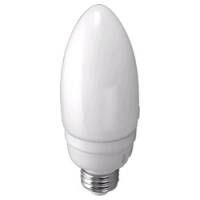 This small torpedo-shaped compact fluorescent bulb is particularly suitable for use in decorative wall sconces, some ceiling fan fixtures, and chandeliers. With an 8000 hour rated life, it is likely to be years before you need to change this light bulb. This 14 watt bulb is approximately a 40-60 watt incandescent equivalent. It has a standard medium base. Note that this bulbs is not dimmable.